Don’t you hate it when you’re watching a presentation and it feels like it’s the first time the speaker has ever said these words out loud? That they’re basically just reading a paper to you? Isn’t it annoying when a speaker realizes — halfway through their presentation — that they’ve crammed too much information in for the given time so they start to just skip through their slides? Or worse: they go over time. We all hate these things when we’re in the audience, so you can probably relate to them. But if we’re being honest with ourselves: We’ve all been that presenter, too. We all know why it happens: We’re too short on time to do everything on our to do list, and practicing our presentations often gets sent to the very bottom of the list (if it even makes it there to begin with). You can’t deliver an effective or engaging presentation, that’s within time, unless you practice it first. YES. 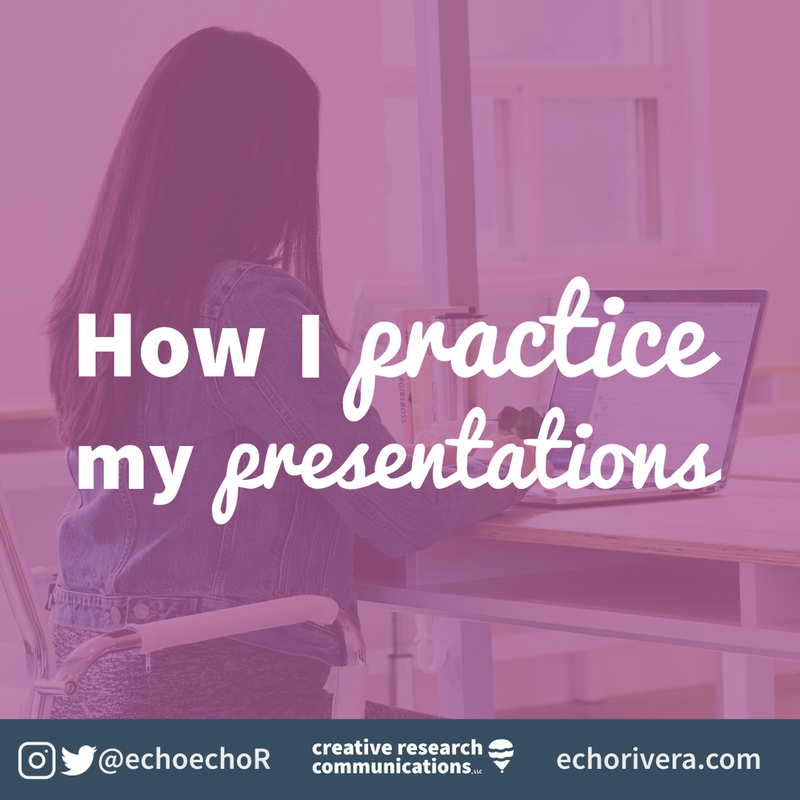 You NEED to practice your presentations. I wrote this post to share some of the easy-peasy practicing strategies that have worked me over the years. Maybe — just maybe — after reading this, you’ll be able to squeeze in more presentation practice. At least give me a chance. What have ya got to lose? Nothing. If you don’t like these ideas, you can continue to avoid practicing. But, if these DO work for you, then you’ll have better presentations. I’ve waited a long time to publish this because people get REALLY WEIRD about advice on how to practice presentations. I think it’s because most people do not practice their presentations, or don’t practice them enough, and they really REALLY don’t like hearing that they should. 1. This is applicable to the first time (or first few times) you’re giving a presentation. Obviously, if you’ve given the same presentation a billion times, you don’t need to do this level of practice. 2. YES. You should have a script for your presentation. Even if you don’t use it when presenting, actually writing your thoughts will force you to create a presentation that has good structure and is easy to follow (I call this presentation storyboarding). A script helps you avoid the “fact dump” #DeathByPowerpoint type presentations that are common in our line of work. 3. You should be giving yourself enough time to make revisions to your slides. This works best if you aren’t writing your presentation on the plane. BUT, the good news is that the first couple are extra helpful for those last minute presentations. 4. This is the exact process that has worked for me, personally, for a really long time. If it doesn’t work for you, that is totally fine. I’m glad you have something that works for you, but there’s no need to attack me for sharing my own process. This is all just an idea for folks who are struggling to fit practice sessions in. Now that we’ve covered the disclaimer, let’s get started with the 4 types (phases) of practicing your presentation. When I'm working on a new presentation, or doing new edits, I will talk to my computer while I type out my notes. This is the easiest way to get your initial practice in, because it makes you speak your notes out loud, instead of just speaking it inside your head. #DeathByPowerpoint covers more than just bad slide design. It includes presentations that feel like one long monologue—like the presenter is just reading a manuscript to them. You need to say the words out loud to know what it sounds like. What works for written communication does not always work for verbal communication. Specifically, the FIRST TIME you’re drafting NEW THINGS TO SAY in your presentation, say it out loud while you type. Yes, it’ll be weird at first and will take getting used to. Yes, you may need to whisper if you’re in a public space. But, it’s worth it because this strategy alone will immediately help you write your first draft in a way that’s more appropriate for verbal communication. And, if you do this for your whole presentation, then it means by the time you have your first draft, you’ve already done one round of practice! After I have a full draft, but I'm still on an early round of revising, I will do mini bursts of practice. For example, let’s say I just created 10 slides for one key point I’m making. It would be good to do a quick check to see how that key point flows. I'll go to presenter mode, and speak through those 10 slides (or whatever section). This is when I start to take notes on my practice worksheet, so I can easily keep track of what changes I need to make. When I go back into editing, I will do Practice Type #1 again (speaking my notes as I type them). You don’t need to have a lot of slides to do this type of practice. Sometimes I only do it with a couple slides at a time. By the way, I’ve made my practice worksheet free to download. This is a really manageable way to get yourself saying your presentation out loud, without feeling like it’s taking a long stretch of time. It only takes an extra few minutes to do this step, so it never feels like I’m taking a lot of extra time to practice. I stay in this “step” or “type” for a while until I feel like the entire slide deck is ready, or until I’m stuck and don’t know what to work on next. Once I feel like my presentation is close to being done, or I’m stuck, I’ll do a more thorough and timed practice run. Once again, I’ll be using my practice worksheet for this. However, because this will be timed, I usually wait until I’ve done Practice Type #2 a couple times. I don’t want to spend a lot of time writing down notes, because that will skew my final time. Practice Types 1-3 are usually all you need for a webinar, because I could use my script during the presentation, if I want. That’s another reason it’s so helpful to have the script basically written out. For really important in-person presentations, or presentations I’m worried about, I will also do a full "dress rehearsal." This is where I practice it, from start to finish, as if it were the real thing. I put my laptop on a tray table, hook it up to the TV using an HDMI cable, and give the presentation. You could, of course, just use your computer or laptop, but the key is that I can walk around like I will for the real thing, and even talk a little loud (like I will during the presentation). It helps to have a friendly audience when you do this one. I use my speaker notes in different ways at this point.. It depends on how familiar I am with my slides, and how new the presentation is. I might refer to the speaker notes from the app, or I might have them printed and have them in my hand. Now here’s the thing: I do NOT recommend memorizing your notes. No one has time for that, and it’s not even that ideal. It makes you less flexible, and makes it harder to handle problems that might come up. So here’s what I recommend instead: Kinda-sorta improv-ing it. If I’m going to do a couple “dress rehearsals” then the first time I’ll just read through my script; the second time I won’t read them and I’ll “improv” it. In other words: I’ll do it without looking my notes. Or, at least I’ll try. Except, it’s not really improv because I’ve been through practice types 1-3 already, so I already know what I want to say. By completing all of Steps 1-3 BEFORE getting to the dress rehearsal, it’s relatively easy to kinda-sorta say the same stuff each time, but also with some natural variation. This “Dress Rehearsal” is the hardest and most time consuming of the 4 types. If you’re struggling to fit practice sessions in, then it might be because you’ve prioritized this one, or moved onto it too soon. 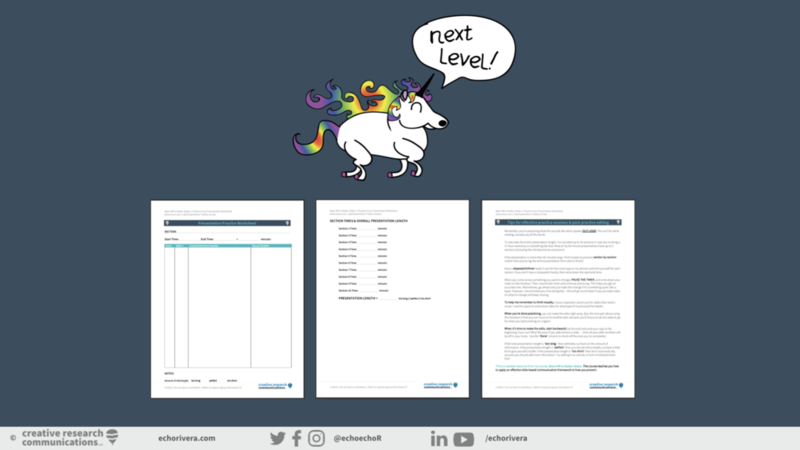 Imagine if you’ve skipped over types 1-3, and jump to a 45-minute practice session only to realize you have a lot of edits to make…which also means another dress rehearsal is needed? Ugh.That would be overwhelming and discouraging for anyone. It is much less stressful to find all the minor edits early on, and it’s not a big deal to make those edits at the early stage. The more time you spend in Steps 1-3, the less daunting it will feel to practice AND it shortens how long you spend doing dress rehearsals (if at all). So, if you’ve been struggling to practice then hopefully you see some ideas here that will help you fit it in. And, hopefully using my practice sheet helps you too!